Let me start this out by showing off the completed box and then boring you with the details later, I’ve often said “it’s all about the wood” and in my mind this project exemplifies that! After glue up it was time to trim the excess tail material. More than your usual 1/32″ or so due to the angles that were cut on the side pieces of Wenge. Spalted Maple is difficult to cut cleanly, even with a freshly sharpened paring chisel with a 20° bevel. It tends to “chunk out” so after cutting as closely as I dared it was time to do some sanding — happy to report that all went well. 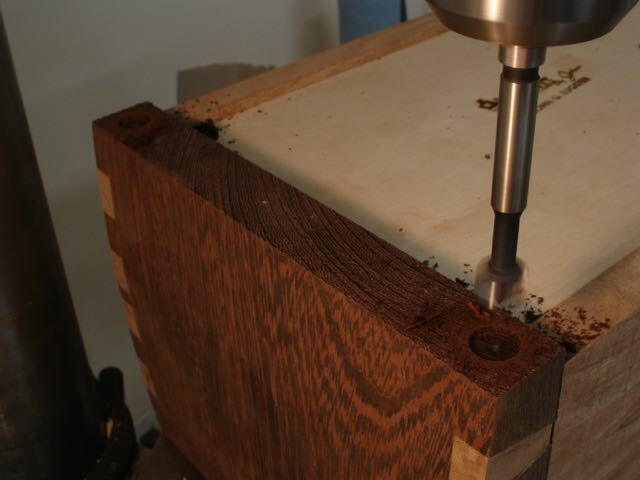 Mortises were cut for the stop hinges as well as the lid lift which was actually a cut-off from the sides. I used every bit of the wood I could for this project. Another request from the client was for a tray, this was made from the last piece of Spalted Maple I had and you can see the grain is much more pronounced. Just enough to make a square tray for it using mitered joinery and the packaging tape assembly method. A 3/16″ piece of plywood for the bottom sits in a groove made with the plow plane. The tray and the bottom of the main box were lined with burgundy velvet. Counter bored hole for silicone pad, notice the cathedral grain on the Wenge caused by cutting the angle — like it! The only request that wasn’t met was an engraved nameplate of sterling silver. After checking numerous local trophy shops, on line jewelers, and Etsy shops I was unable to find someone capable of engraving it. My client settled for a standard, silver (aluminum) plaque from a local shop. Apparently sterling is difficult to engrave but can be sand blasted or cut with a laser. Seems it just doesn’t do well with automated processes. The finish on this project is platinum shellac and wax. The process used to attach the silicone feet was changed for this box. Rather than just stick them on and run the risk of them being knocked off a flat bottomed hole was drilled into the bottom first and then a spot of crazy glue added to help keep it in place. It also lowers the box a bit which I like. So, thanks to USPS Priority mail this project arrived safely three days after being brought to the Post Office. My client was very happy with this project and really, isn’t that what creating these things is all about? This entry was posted in Current Commission, Etsy custom order, Etsy Store, Hand Cut Dovetails, Hand Tool Woodworking and tagged burgundy velvet, lid lift, shellac, silicone feet, sliding tray, Spalted Maple, stop hinges, Veritas small plow plane, wax, Wenge. Bookmark the permalink. Very good looking box John! Lots of subtle details that really set it off and the wood…your wood selection takes it to another level. My experience with spalted maple is very limited, but I know that it is unforgiving stuff. Spongy, some sections crumble if you look at them funny and other sections just jump of the parent wood for no reason. I’m sure this project was a little nerve racking. Thanks Greg, you’re right about the sponginess of the Maple, definite sigh of relief when this one was done!